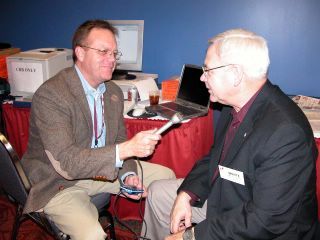 The first interview is with Cattlemen’s Beef Board CEO Monte Reese. He’s the better looking one talking into the mic. Beef demand increased more last year than any year recently and Monte talks about what that means in our next podcast available here: ZimmBlog Podcast. All the usual press conferences are going on and the trade show’s about to start so while you listen, I’ll go wander around. Just got into the convention center and getting registered. Heading to the trade show momentarily. Hello from San Antonio. 2nd hotel. The first one didn’t have working high speed access. Can’t have that. I promise not to make you look at pictures of me. I’m just happy to be in my room and ready to go. It’s off to the convention center next and see what’s going on. I’ll start out in the media room and post more later. Let me know if there’s anything in particular you’d like to see me cover while I’m here. Post a comment or email me. I just couldn’t leave a wimpy little post from a cell phone on my blog while I’m travelling. I just sent that last post to show you that if you’re really desparate, you can even use a pretty standard Sprint phone to post a message on your blog. I’ll be getting in to the Cattle Industry Convention tomorrow afternoon and will begin posting information as soon as I find it. post from a cell phone. 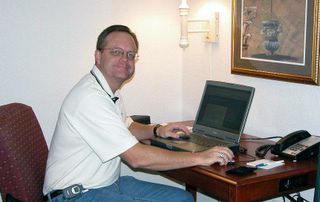 I’m seeing more and more articles written about blogging and especially having the company ceo start writing. Here’s a link to a good one that’s worth passing along. This post is coming from my Dell Axim PDA wwireless card. Shows how you can update from almost anywhere, anytime! Are Press Releases A PR Strategy? I think they can be a very important part of a communications plan or we wouldn’t have a business that focuses on the production and distribution of press releases. I like to refer to them as news releases since reporters are looking for news. They’re not looking for an opportunity to provide free publicity to some company or organization (usually). Here’s an interesting post that I thought you might want to read and contemplate. I will admit to not having read the book, which is the subject of the post. But it does contain some excerpts and in particular I agree with one phrase about genuinely helping the reporter do their job. That’s why we strongly encourage sending audio to radio reporters. That helps them and makes your release more likely to be “used.” So here’s that post. I’d be interested in your thoughts, especially if you’ve read the whole book. High on the book’s myth list is the venerable press release. “In our digital world of minute-by-minute news updates and rampant information overload, press releases can be the least effective way to get your message across to your target audience,” says VandeVrede. Who is the target audience for PR? Not the purchaser or end user of your products and services, as most companies believe. Instead, VandeVrede’s book maintains that, the editors and analysts responsible for writing about your company and its products can be your biggest obstacles or your strongest allies in getting your message across — and genuinely helping them to do their jobs can pay big benefits. Things are heating up here at the office. We’ve got projects going on this coming week for United Soybean Board, National Biodiesel, Missouri Corn Growers Association, Missouri Beef Industry Council and of course Southeast AgNet. Plus I’ll be travelling to the 2005 Cattle Industry Convention on Wednesday and hopefully blogging my way through it, going and coming. Look for audio, pictures, thoughts, news and just about anything I come up with. There’s a big trade show there and I plan to talk to as many communications people as I can to find out how enlightened they are about the blogging and Talking News Releases. Check back often or better yet subscribe to our blog and be notified of new posts automatically.